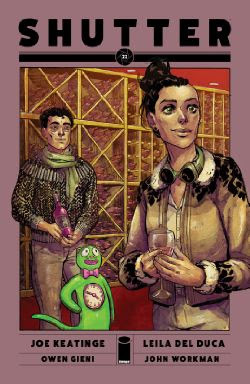 Joe Keatinge and Leila del Duca’s comic Shutter is one of the best titles currently published by Image, but you wouldn’t know it unless you’re actually reading it. That’s not to say it isn’t praised and talked about, but even among the publisher’s lineup more focus has been given to well-known titles like Saga, The Wicked + The Divine (where Leila del Duca was a guest artist for an issue with the Morrigan) or The Walking Dead. Despite that, the comic is chugging along, and this week finished its fourth story arc and second act at the same time. Shutter tells the story of Kate Kristopher, a traveler, adventurer, explorer and writer from an alternate Earth with super-science, magic and many different nonhuman races. At the start of the series she learned her father, Chris Kristopher, had more children before her – and that she has a younger brother. The last of those was especially problematic, as at the time of the boy’s birth her dad was supposed to be long dead. She also discovers her family is at the heart of conspiracy that shaped the world for many years – to the point that it’s impossible. So, at the end of last story arc, Kate announced her intention of ending it in its current shape, with the help of her family. The fourth arc was devoted to gathering the rest of her thus far unseen family and planning their next move against Prospero (the society in charge of the world). But that’s only half of what the issues are devoted. The rest is focused on filling in the gaps in the Kristopher family and their allies’ history. We finally discover how Kate’s dad got as many children as he did – and we see more of Kate’s past relationship with female gunslinger Huckleberry. This issue marks the turning point in the whole story. A heartbreaking one, as the meeting with Kate’s final sibling ends with a series of twists and reveals that wouldn’t be out of place in a Kieron Gillen comic. The finale is so shocking, in fact, that this is the only issue that doesn’t end with readers’ letters segment – instead it ends with a black page informing us of Shutter’s return in October. Once again, Keatinge and del Duca played on our heartstrings. And I can’t wait for more of their amazing storytelling and art. The information that this issue marks the end of Shutter’s second act suggests that we’ve only got two more story arcs to go – and that the plot momentum will only increase until the finale. It’s going to be one hell of a ride. 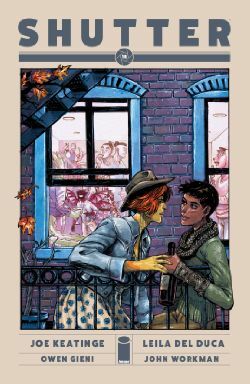 Shutter is written by Joe Keatinge, drawn by Leila del Duca and colored by Owen Gieni. The first three volumes (Wanderlost, Way of the World and Quo Vadis) are available right now. The fourth volume, All Roads (collecting this story arc), is set to be released on August 3. Dominik Zine is a nerdy lad from northeastern Poland and is generally found in a comfy chair with a book in hand.